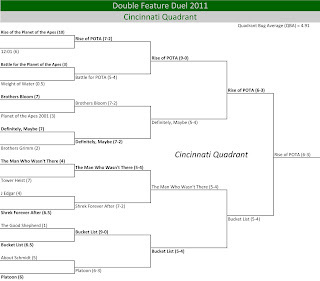 And so after 7 Planet of the Apes movies, one finally rose to the challenge and made it to the final four. Congrats to the Rise of the Planet of the Apes for joining Big Fish and The Nines in the Final Four, making it three 10-bug (or above) movies. And this was certainly the easiest quadrant to do it in, with a Quadrant Bug Average of 4.91, down over a point from the Philadelphia Quadrant. The four movies it needed to beat to get here only had a bug average of 5.63, compared to the 6.88 and 6.63 that The Nines and Big Fish collectively had to hack their way through. The competition gets a little tougher now. Well, maybe. We’ll see in another 16 movies. 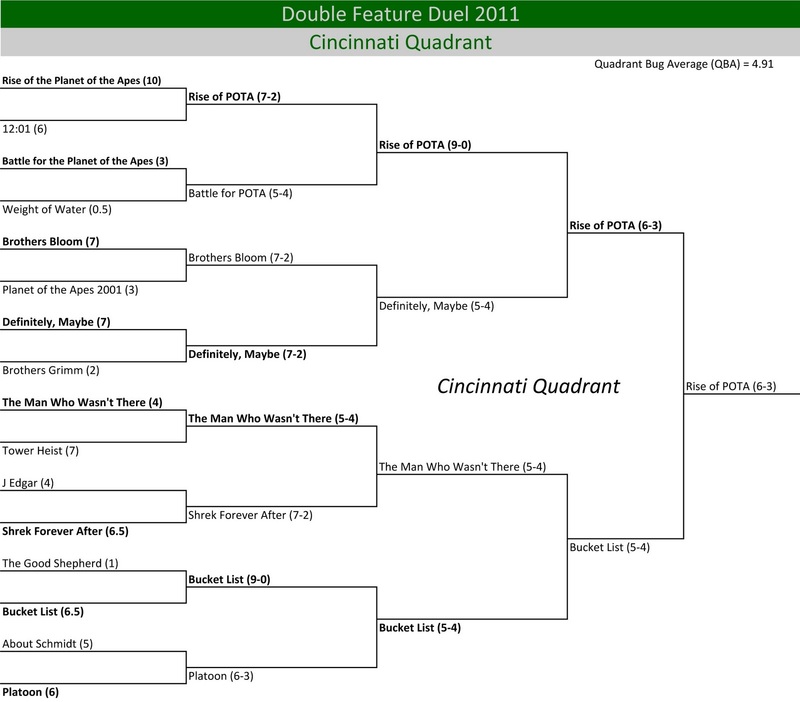 Low QBA: Maybe it was the mood I was in over the month of the Cinci Quadrant, but there were 5 movies with a 3-bug rating or less in this, including two that didn’t crest the 1-bug mark (The Weight of Water and The Good Shepherd). Upset: The 4-bug Man Who Wasn’t There figured out this game, beating two movies at least rated at a 6.5. Largely behind the strength of its title, the very boring black and white Coen Brothers film bested the much more lively Tower Heist and Shrek Forever After on its way to a 1-point loss in the Sweet 16 to Bucket List. Romantic Comedy Time: I was applauding Definitely, Maybe as the first romantic comedy to make it to the Sweet Sixteen against the odds. Then I went back and realized it’s the first romantic comedy actually in the tournament. The Invention of Lying and Stranger Than Fiction were comedies with a romance aspect, but it’s not the same. Lastly, thanks for reading this. Whoever the hell you are. I’m assuming it’s either me from the future or maybe, just maybe, I’ve finally made it so big that somebody found this blog and is obsessed with me. In which case, sorry, but I’m married. Well, I hope I’m still married.